Request 1 or more ring sizes here. This mens ring has a plain sterling silver sand cast shank and is inlaid with traditional multi colored stones. Top of ring measures just over 1/2" in diameter. 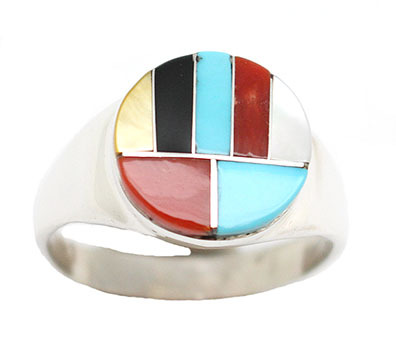 Handmade by Zuni artisan Johnson Laweka. Available in size 10, 11 & 12. Choose size(s) when ordering.